After Triumph in the Skies 2 <衝上雲霄 2>, Chilam Cheung (張智霖) and Francis Ng (吳鎮宇) collaborates again in the latest police thriller The Leaker <洩密者們>. When mentioned together, many fans would often link them back to Triumph in the Skies 2 as the series’ legendary pilots, but in reality, the pair’s very first collaboration was in 1997. In a movie called Theft Under the Sun <豪情蓋天>, Chilam played a role as an under-cover cop and Francis played a psychiatrist with a stutter. Thinking back, Chilam said there were very little scenes between the two at that time and their one scene lasted for a split second. Like-wise in Triumph in the Skies where the two had polar opposite personalities, the two will be playing cops from two very different places – Francis, a police officer from Hong Kong versus Chilam, who is playing a cop from Malaysia. A straight-forward and quiet cop hailing from Malaysia, Chilam plays an officer who abides by the rules and attends to his superior’s orders at all times. In stark contrast to Chilam’s classic cop personality, Francis never plays by the rules and will always have his own way of solving the crime even if he has to use the most extreme methods. 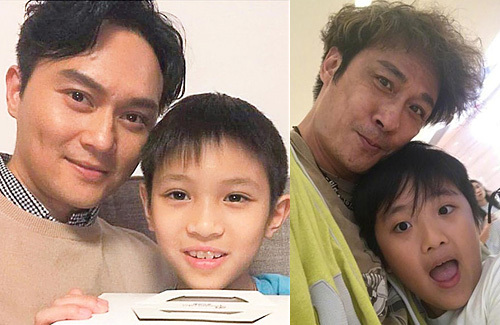 While the pair’s personalities are complete opposites in The Leaker, in real life, Chilam and Francis are both good fathers who enjoy talking about their sons. Preferring to treat his son more like a friend, Francis said he often brings his son to work with him so that he understands what it is like on the set. However, Chilam never lets his son accompany him to work because he does not want the staff to look after him at all times. @coralie LOL. My first reaction is to take the damn * away and clean up. I’ve known parents with mentality that you tell your kid no once, but if they persist then let them learn first hand; as long as it’s not life threatening of course. I know someone let their kid eats glue. He spat it out and never asked to try it ever again. Lol. They also said this taught the kid that when they say no to something, the kid is more willing to listen because of bad experience with the glue. Different strokes for different folks. I say as long as the parents are involved in the kid’s life, it’s a great positive step forward. Rock on, parents! I’m not sure I agree with their philosophy of listening and not scolding. Though I see the need for understanding children, a parent is a parent, and not a friend. Children need rules and boundaries. As a parent I lay down the rules. I don’t always explain why they can or can’t do something and honestly it’s not for them to understand, sometimes “no” is just “no”.